Hi, my name is Pat, and I am your Thai and English speaking Local Expert! 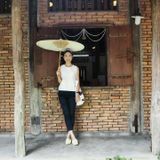 I was born in Bangkok, and while spending 8 years in Bangkok in marketing job, I decided to move back to my hometown in Chiang Mai to spend time with my family and the mother nature. We have a garden where we grow vegetables and fruits for own use and also for sale, and working in the garden is my most favorite part of everyday life. My hobbies are gardening, cooking, and bicycle riding. I really like to cook, and I can cook all kinds of food from traditional Thai food to fusion, which is more like an up-to-me kind of dish. I focus my dishes on health benefits and ingredients that can be found in our garden. I believe in natural healing and herbs as a medicine. Our ingredients are from our organically-grown garden. We grow our vegetables and herbs with love and care for our health, combining with the knowledge that are passed along from generations within our family on how we treat ourselves with natural healing and food as medicine. Come join me and my family to experience a peaceful living, local food and let the nature embrace you! Trips created by Pat K.
My two friends and I loved our cycling tour with Pat and her family! The day began with Pat and her husband picking us up at our hotel and driving us out to her family's home in Mae Teng. The home is incredible-- Pat's grandmother and mother have spent years creating a garden that grows every Thai fruit and vegetable you can imagine. We were given a tasting tour of the garden and were then brought to the kitchen to sample the family's "signature smoothie" (delicious) and learn how to wrap sticky rice for our picnic lunch. We then ventured out on our ride, which took us to an orchard/garden and along the village roads. We made stops along the way to snack on street food and pick up dessert for our picnic lunch. When we reached our lunch destination, Pat and her husband had set up a beautiful table with a huge, fresh, tasty spread. On the way back, we stopped and climbed to the top of a hidden temple that provided one of the most stunning views of the day. We returned to the family home for a final snack of papaya and coconut water before Pat and her husband drove us back to the city. I can't say enough about how kind, friendly and knowledgeable Pat and her family are. We felt so welcomed, and I learned more during our tour than in the previous week I had spent in Thailand. As a bonus, Pat's husband filmed the entire trip with his GoPro and sent us an edited highlight video, free of charge! If you have an opportunity to take this tour-- DO IT! Thank you for your feedback, Elissa! After personally experienced this cycling tour, it was really a nice one that I have done. It's quite easy & nothing to worry at all. Moreover you get a chance to enjoy the beautiful peaceful village, the farms, the temples as well as meeting some friendly locals. According to Khun Pat, she has a few cycling routes available to suit her clients' need according to his/ her fitness level. Great!! Love her mum's home cooking the most & started to miss most of her delicious foods served too during stay, the picnic lunch, dinner & packed breakfast the next morning for my early flight. Personally also very impressed with the fresh garden picks & then home cooking concept. Am sure most of the guests who had a stay experience here would enjoy & love it too.